…and therefore my backside projects Infinity and Malifaux are seriously late! I got about 5 weeks until my departure to Australia and I haven’t painted sufficient models to play even one lousy tutorial game . This week though will be better – that’s certain. It can’t be worse. I have serious hobby plans, oh yes I have. I want to paint few miniatures and sort my travelling painting set. At least some part of it – at first I’m going to arrange minis I want to take with me for the trip. There will be much more than last year. I’m planning to travel around 6 months, so I’ll need some. At least two – three small plastic boxes. And second thing – paints and brushes – I’ don’t want to have the same situation like last time, when I was in Costa Rica, Puerto Viejo – far, far away from civilisation with no possibility to resupply. I need to have everything prepared carefully this time. I hope I’ll find some more time to paint few Infinity and Malifaux models – I already have primed Nephilms and I’m almost done with Valdgeists. All from Neverborn faction. I hope I’ll finish them soon enough and they will join to the ranks painted Neverorn by Game of Travel:). Like this guy I’ve finished last week – Barbaros – really angry and mean Nephilim. Barbaros is Nephilm, captured by humans and trained to fight in the pits. He was enchanted by carefully chosen magical items, enhancing his skills and strength to maximum, but unfortunately humans divested him the ability of flying. Sad story – Nelphlim that couldn’t fly among the clouds! But he became strong, resilient and very fierce Neverborn, even though he will never become fully grown Nephilim. He will bring the doom upon the humans for sure! They will regret they came trough The Breech! But what exactly Barbaros can do during the game? Well, as I described many times before, I’ don’t have any clue how things going on during Malifaux gameplay – I’ve never played the game. I only read rules carefully and follow battle reports on the blogs and Youtube channels. My knowledge is growing – but without actual game of Malifaux, I can’t say. Not an expert – not even rookie. It’s hard to build the faction when you didn’t play even once – I can tell you that, but if you follow one important rule, it’s getting easier. No pressure. Pure fun. 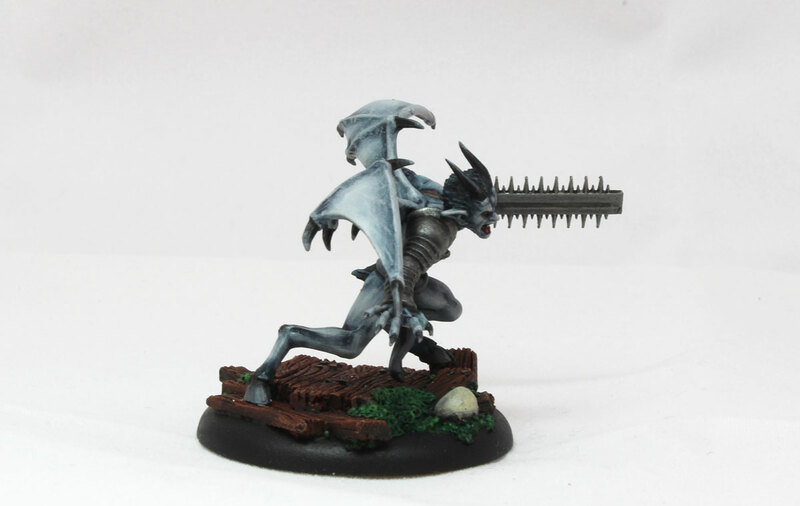 Just buy and paint miniatures you like and you will have awesome time painting them. I follow that rule and I’m very happy. Just don’t care about what guides all over internet say about how you supposed to start your army – just purchase what you might like and worry how to use it in the game later. And I apply that rule to all the game I play ( or to play soon) – it work fine:). 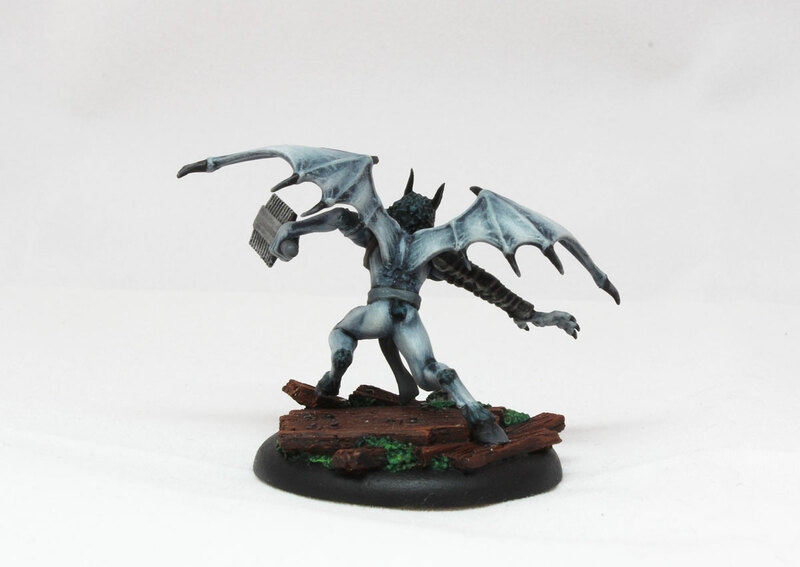 Following that rule – I bought Lilith box – awesome minis and Barbaros is the frosting on the cake. Awesome model! I painted him with Administratum Grey as base colour and Drakenhof Nightshade as wash. After that gradually I was lightening all his body up. Relatively easy to paint, but I wanted Barbaros to look as cool as possible so I was painting him very slowly in few stages. Few days ago I finally finished him and here it is! Base – resin wood base from Micro Art Studio. Great stuff – wooden floor with skull stuck between the planks and green moss. It suits perfectly to Barbaros and looks awesome! Next models – almost finished Valdgeists. I should painted very soon. Future plans: one more battle report to write (battle of WHFB 8th edition – vs Orcs & Goblins. To be honest there were only Goblins in opponent’s army. It was remarkable experience!). 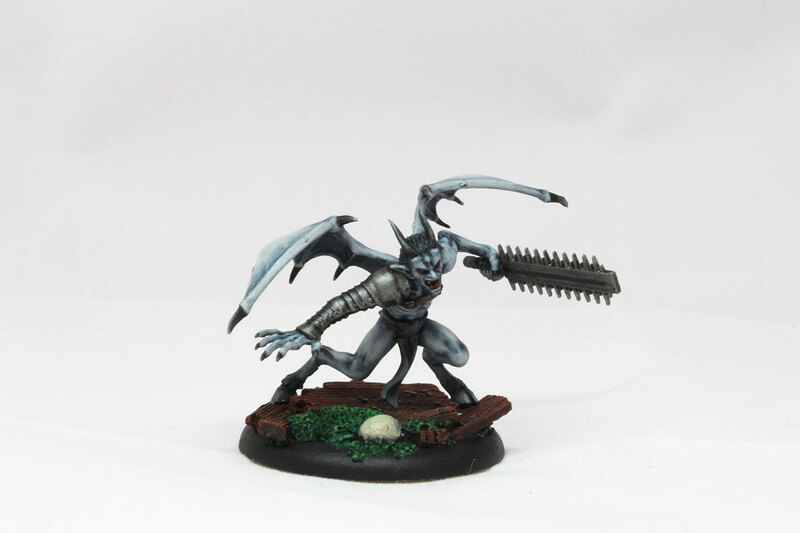 Beside that I need and I want to paint last few models to play Malifaux, and according to my calculations – 6 minis to finish my 200 point Bakunin force for Infinity. Will I make it until 20th October? Do not know, but it’s possible. I just need to focus, sit tight and paint! I also have few battles scheduled for upcoming weeks – Brettonia, Dwarfs, Empire and Orcs & Goblins. Exiting time ahead, I give you that! cool mini – simple and effective paint job, and that sword looks really nasty! Nice painting, but I feel that it’s a little too monotonous with the silver metal so close to the blue/grey skin. Still, it’s a whole lot better than anything I’ve ever produced so who am I to criticise 🙂 ? maybe, you are right – I should made the blade in other colour – maybe copper with some blood stains on it?